Key to Learn Sub Sub & Cuspal Interlinks Theory is written with the sole objective of enabling the readers to master the fundamental concepts of Cuspal Interlinks Theory as achieved by the participants in the lessons presented in the workshop conducted on MSN Groups KCIL.Each Lesson is written in simple, lucid and easy to learn style and has a Practice Exercise which provides the reader with an opportunity to test his comprehension. Answers of each Exercise are placed in the end of the book.This book however, is not a substitute for the book on Kalamsa and Cuspal Interlinks Theory. 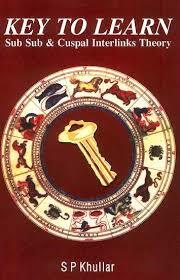 If the reader masters the contents of this book, he will be able to use the concepts illustrated in the books on Natal and Horary Astrology much quicker and easier.Sub Sub & Cuspal Interlinks Theory is in tune with the Navamsa and Nadiamsa concept of Nadi Astrology. The reader will find that it offers sound techniques of predictive astrology.How to analyse the horoscope, to determine what is promised for the native for all walks of human life, has been explained in simple and scientific way. Whilst timing events and use of transits are often thought of as complex and incomprehensible, it is dealt with here in a very clear and practical way with many actual case studies.